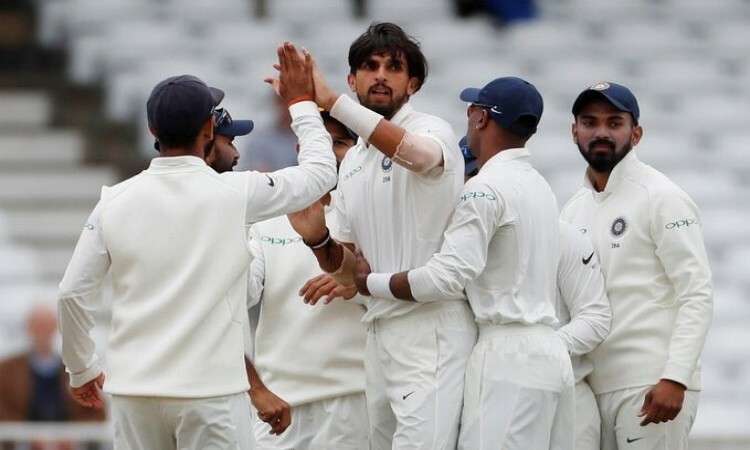 Southampton, Aug 30 (CRICKETNMORE): India dominated the opening day of the fourth Test match as the visitors first bowled out England just a few overs before stumps and then scored 19/0 at the Rose Bowl Cricket Ground here on Thursday. The day started with Indian pacers wrecking England's top order, taking four quick wickets to reduce the hosts to 57/4 at lunch. Electing to bat on a track with a tinge of live grass, England's opening woes continued to haunt them as Keaton Jennings was trapped plumb in front by an excellent incoming delivery from Bumrah, for a duck in the third over of the innings. One over later, Bumrah almost sent packing English skipper Joe Root (4) when he was on two, before the Decision Review System (DRS) came to the latter's rescue. Root was trapped plumb in front but television replays showed the bowler had overstepped. Reduced to 15/2, England's hopes were pinned on former skipper Alastair Cook (17) and Jonny Bairstow (6), playing as a specialist batsman after injuring his finger. But Bumrah scuttled such ambitions by scalping Bairstow, caught behind by Rishabh Pant in the 13th over before first-change bowler Hardik ended Cook's 55-ball resistance, thanks to a brilliant low catch at the third slip by Virat Kohli. The final session saw Moeen and Curran stabilising the hosts innings, forging a crucial 81-run partnership. After Moeen's wicket no other batter supported Curran, and as a result the hosts were bundled out for 246 just before the end of play.